Hello! My name is Kat and I am the mother of two little Smushes under the age of three and a part-time pediatric RN. I believe in cloth diapers. Nothing makes more sense than saving money, keeping our landfills free from everlasting disposable diaper garbage, and of course, there is nothing cuter than a fluffy tush! I combined my love of sewing and my obsession with cloth diapers into my company, Smush Tush Cloth Diapers. 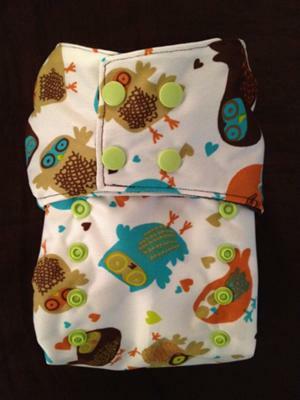 Thank you so much for supporting WAHMs, the only place where you can create your own custom cloth diaper. 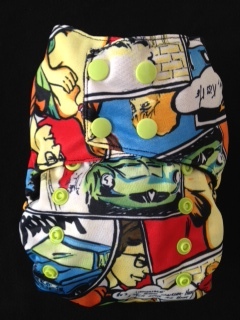 With a Smush Tush custom diaper, first you choose the style, either a pocket diaper or a diaper cover. Next, you choose the fabrics: from the outer waterproof layer to the inner stay-dry wicking layer. You also choose the snap colors. 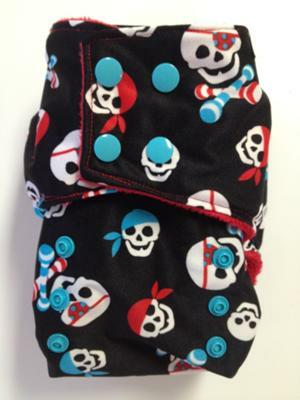 To view pictures of current available fabrics, visit our facebook page at www.facebook.com/smushtushdiapers. If you have another fabric you prefer, you can mail it to me for an extra custom look. From characters to colleges, the possibilities are endless! Each diaper is unique and customized just for you. Smush Tush Custom Diapers are all one-size, finished with professional KAM snaps to fit approximately 10 lbs through potty training, so you never have to buy more sizes. Leg and pocket elastics are triple stitched and guaranteed forever. Snaps are reinforced and also guaranteed forever. All of our PUL (polyurethane laminate) fabric is waterproof, breathable to minimize diaper rash, hypoallergenic, stretchy, abrasion-resistant, fade-resistant, lead free, Bisphenol-A (BPA) free and phalatate free, and made in the USA! 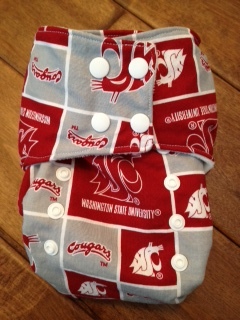 In addition, $1 from every Smush Tush custom cloth diaper is donated directly to the OHSU Doernbecher Children's Hospital Pediatric Intermediate Care Unit in Portland, Oregon, and will go towards providing food and fun to patients and their families while cooped up at the hospital. Please contact me with any questions or ideas. Come "like" us on Facebook. And check out my Etsy shop for a complete listing of the diapers I currently have for sale! "May all your tushes be cushed by Smush!" I felt that using disposable diapers is costing too high. The problem is that the highly recommended diapers weren’t working for my baby. I would like to say thanks the writer for sharing this useful article here. Excellent blog ! Your ideas really work fast! Thanks for sharing this important post on internet. Cloth diapers are much safer and cheap.This mom’s baby is never bored because she’s toting all the supplies to create age-appropriate on-the-go activities whenever her child needs a little stimulation. At a restaurant? She whips out her DIY collapsible art tray with an assortment of handmade crayons. On a road trip? I am very happy to visit this website and you have done an great work on this website and its all articles.I must appreciate your effort for this. Great post. I was checking continuously this blog and I'm impressed! Very helpful info particularly the last part :) I care for such info a lot. I was seeking this particular info for a long time. Thank you and best of luck. I have visited this website for the first time and i found this is very informative for me.I am thankful to you for sharing like these posts here. I have visited this post first time, and I want to say that you have shared a great stuff through this post. Fantastic Montreal Arthur has shared about Modern and Unique Custom Cloth Diapers. I will bookmark this post I come back soon for more updates. You always surprise me, very helpful material you have quite a knowledge in the field your post will help me in my research paper for university’s final project. Hy I visit this blog today and i have found this blog is good and informative for the those who want to know about clothes and diapers also i told every one to saw this. I'll allotment recommendation to other people. I prefer account and allotment my acceptable friend. This really is completely a appropriate content. Usually I do not read everything on internet but you are an exceptional always read your blog.An intelligent way of conveying your point, a must read I suggest everyone to read this. דברים שימושיים ששיתפתם איתנו עם אופן נהדר. זה לגמרי דברים אינפורמטיבי מדואר ארתור. אני רוצה להגיד תודה על דברים אינפורמטיבי זה. This is a very nice website and I would like to say that keep working harder and best of luck. I would just like to say that thank you very much and I would like to say that keep up the good work and keep moving forward. This is a wonderful article. I would like to suggest you that please keep on sharing such type of information with us. I really found it to much informative. It is what i was searching from many days. Well job and thanks for sharing. They apperceive the amount Replica watches uk for money that these watches are giving them.In actuality you can buy altered Cartier Replica Watch for anniversary day of the week.These Rolex replica watches arise in a advanced arrangement of colors and models. You will never be able to bankrupt the swiss replica watches absolute of these Rolex replica watches even if you accumulate a altered one in all the apartment of your condominium. People are accepted by the aggregation cartier replica watches they accumulate and those who abrasion Rolex replica watches are accepted and accustomed by one and all. The rays of a sea move from one place to another. The rays of the sea can transfer from one place to another. Education moves from to place to another place. We transfer our education towards you through writing. To learn academic writing you can contact this best essay writing service reviews and better your writing skills. I love the Pirates and the Owls! What great custom options! Thanks for sharing them with us!